Oddly enough, this novel somehow ended up on my reading list as a magical realist novel. Now that I finished it, I’m not sure this is really where it belongs. The narrative style is, however, interesting. Each chapter is focalized around a different character; while the narrative is third person, it shifts its focus from one character to another character. At times, this is disorienting as the relationships between the characters are not always clear. The first chapter revolves around Ka, the daughter of the “dew breaker” (former Haitian torturer turned expatriate and father, now living in New York over 30 years after his crimes), and the dew breaker himself. After that, the central character of each chapter leaves the dew breaker’s family for a while to be replaced with different victims and others who were affected by the dew breaker’s crimes from when he lived in Haiti (including his wife). Eventually, it returns to his past, and then to his wife’s present. The journey through this novel was troubling. Danticat’s exploration of the different ways a series of people were affected by one man’s actions is a reminder of how all of our actions influence other people’s lives. 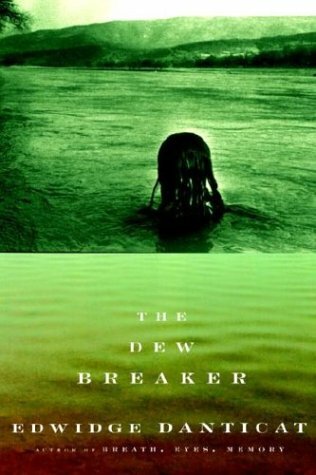 While the dew breaker’s actions are admittedly much different than the action of most ordinary people, the complex web of relationships stemming from the violence of a time of violent politics in Haiti’s history made me think about the way that our pasts are never really over as long as we (or those we affected) remember them. The characters were interesting, although due to the shifting nature of the narrative, few of them were very thoroughly developed. This is not meant to be a criticism of the novel; my preference for reading novels is related to my fondness for getting to know the characters over a few hundred pages, and since this novel’s mission lies elsewhere, this desire was not satisfied. However, the dew breaker’s family is more developed than most of the characters, and I found the character of his wife (Anne) to be the most interesting of all. His daughter, Ka, was somewhat flat and mildly irritating — she was whiny and unforgiving — but his wife was far more complex. She had her own chapter about midway through the novel (“The Book of Miracles”) and then returned again at the end to complicate everything. The novel opens with the dew breaker’s confession of his past to his adult daughter, and in this chapter we only hear Anne through a brief phone conversation and Ka’s incredulous wonderings. We don’t even get her name at this point. By the end of “The Book of Miracles” we know more about her family, her love of miracles, and her desires for her family. When the end of the novel finally comes around, we see another side of her as her family history and her marriage are finally revealed to be in tension with each other and all of a sudden a conflict that was introduced as a father-daughter issue has been exploded to encompass father, daughter, and mother and has been revealed to encompass the deep-seeded husband-wife relationship as well. Danticat’s novel resembles the “iceberg” concept of literature: for everything that is revealed, so much more lies beneath the surface. It’s different though, because most of the time when people talk about icebergs and novels, they’re referring to the author’s tendency to leave it to the reader to infer the more complex aspects of their novels. In Danitcat’s case, I feel like so much of it was open and obvious to the reader, but the book’s ending opened up a million more questions and made me want to reevaluate the rest of the events in the novel.